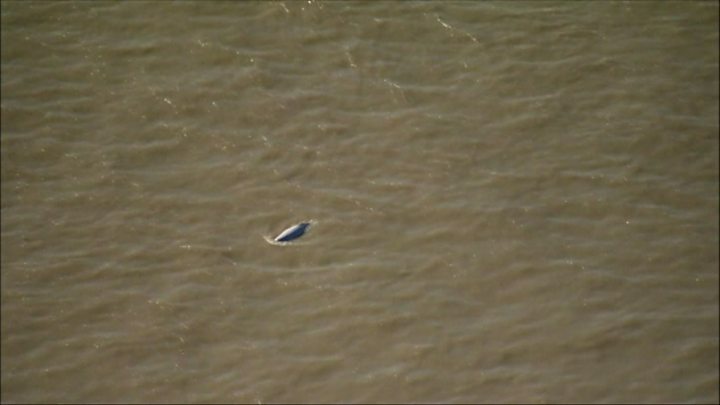 A beluga whale seen in the Thames for a second day is "swimming strongly and feeding normally", the RSPCA has said. The animal welfare charity said the whale, nicknamed Benny, had moved towards the estuary, and there were no major concerns for its welfare. It was first spotted around barges in the Thames on Tuesday near Gravesend. Rescue teams have been on standby in case the animal, which is normally found thousands of miles away in the Arctic, gets into danger. RSPCA spokeswoman Clare Dew said: "It appears to be feeding normally - it is not attempting to come anywhere near the banks and it is staying in the deep channel in the middle of the river." Ships in the river were being urged to keep clear, and the public has been asked not to take to the water to watch it. A spokeswoman for the British Divers Marine Life Rescue said it was sending a team to Gravesend to assess the whale's condition. Julia Cable, national co-ordinator for the conservation charity, said: "It's possible that it lost its way after a navigational error, that it has taken a wrong turn. We haven't got an idea about the health of the animal." Lucy Babey, head of science and conservation at Orca, a marine conservation charity, said: "This is the most southerly recording of a beluga in the UK. Tanya Ferry, environment manager at the Port of London Authority which is monitoring the whale, said the number of plastic bags in the River Thames could become an issue for the whale. "We're hoping if we give it enough space and keep an eye on it, it will find its own way out of the Thames to an environment that's more appropriate for it. Beluga whales were last spotted in the UK three years ago off the coast of Northumberland and Northern Ireland, but sightings were "extremely rare", the British Divers Marine Life Rescue said. In 2006, an 18ft (5m) northern bottle-nosed whale died after becoming stranded in the Thames. The RSPCA said: "We are working with other agencies to monitor the situation and ready to provide appropriate assistance if requested." They range from 13ft (3.9m) to 20ft (6.1m) in length and have distinctive rounded foreheads. Belugas are commonly found in coastal waters of the Arctic Ocean, but are also at home in large rivers. They can move between salt and fresh water.